Piccadilly Revisited is a film and music performance inspired by the life and loves of Hollywood’s first Chinese film star, Anna May Wong, and the classic British silent movie Piccadilly (1929) in which she played a starring role. Composers Suki Mok and Ruth Chan will perform their new contemporary score to the backdrop of an outdoor screening of the silent film, Piccadilly. The score is based on a storyboard developed by co-writers Alice Lee and David Tse Ka-Shing. True Heart Theatre presents Sweet Mandarin, a work-in-progress performance at Tristan Bates Theatre and Asia House, London. Sweet Mandarin, a memoir by Helen Tse, recounts the courageous stories of the three generation of women in a Chinese family, journeying through the poverty stricken rural China to the 1930s colonial Hong Kong and to the present day multicultural UK. The bittersweet tale of trails and tribulations overcome by valor, determination and familial love is an inspirational parable for all. 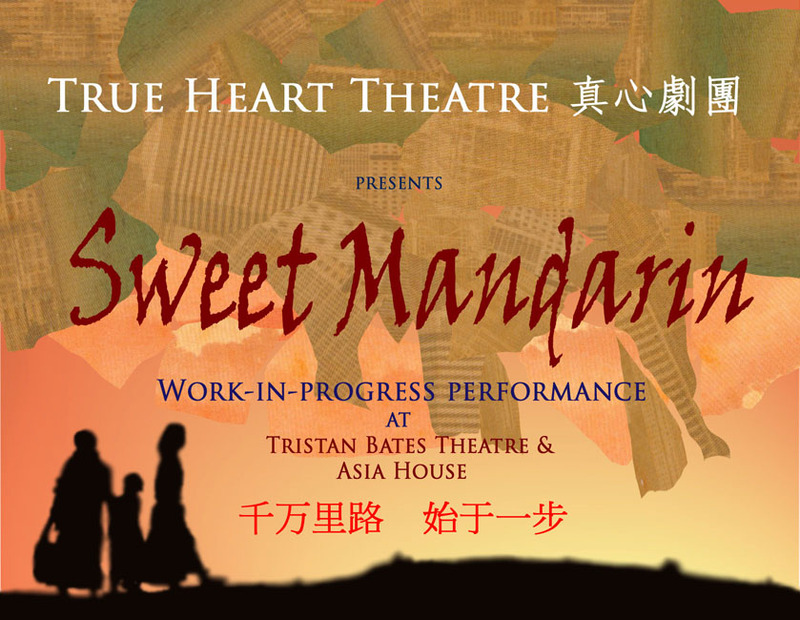 True Heart Theatre, in association with the award-winning theatre practitioners from Hong Kong: playwright Mui-ngam Chong and director Hoi-fai Wu, have adapted Sweet Mandarin into a play. True Heart is proud to present our first work-in-progress performance. Three scenes of the play will be performed, followed by a post-show discussion with the director and actors that will give audience a rare insight into how the play has been conceived. 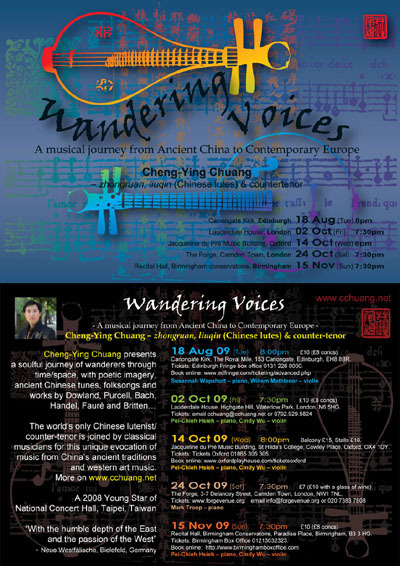 Cheng-Ying Chuang, the 2008 Young Star of Taiwanese National Concert Hall, presents a soulful journey of wanderers through time/space, with poetic images, ancient Chinese tunes, folksongs and works by Dowland, Purcell, Bach, Handel, Fauré and Britten…etc. 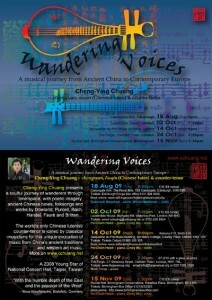 The world’s only Chinese lutenist (liuqin & zhongruan) /counter-tenor is joined by classical musicians in UK for this unique and personal evocation of music from China’s ancient traditions and Western art music. It’s a rare chance to watch a solo recital with two distinguished music cultures fused harmonically through both vocal and instrumental music. ‘With the humble depth of the East and the passion of the West ‘- Neue Westfälische, Bielefeld, Germany. Canongate Kirk, The Royal Mile, 153 Canongate, Edinburgh, EH8 8BR. Tickets: Edinburgh Fringe box office 0131 226 0000.
but evolve from a discussion around image making. In addition, methodologies inherent in Jessica Tsang’s practice also instruct the final outcome of works, particularly an interest in illustrating process. 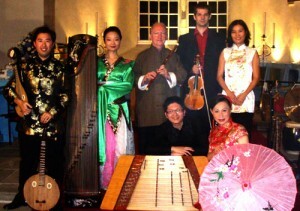 Harmony Chinese Music Ensemble will be presenting a unique programme of solo and ensemble pieces featuring traditional and contemporary Chinese music performed on Chinese traditional instruments in the wonderful acoustic setting of the Canongate Kirk.